Why did you investigate double-top construction for steel-string acoustics? “There’s always a lot of thinking about classic guitars, but we also try to think ahead. Just like Taylor released their V-Class bracing, we have been working on inding our own sweet spot. With acoustics, it’s so dificult to do anything remotely original, after all a D-28 is a pretty good dreadnought. So one thing we do is try to recreate something, but add a lavour that makes you feel as if you’re playing a vintage instrument. “But at the same time, we work with various luthiers and designers to develop more modern stuff that’s at the other end of the spectrum. With the Double Top, both our CEO and founder Qian Ni and Kehua, who is head of the guitar and mandolin workshops, met and talked with a luthier who is well known for making double-top classical guitars. As a result of that, they became very interested in trying double tops with steel-string acoustics. 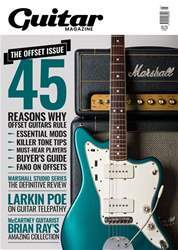 The new issue of Guitar Magazine is available to download now!